Every journey has an end. And after a series of Filipino food tastings for the Department of Tourism's Kulinarya Kalayaan Food Festival which almost seemed endless, we finally found ourselves on to our last stop -- the legendary Café Adriatico in Remedios Circle, Malate. 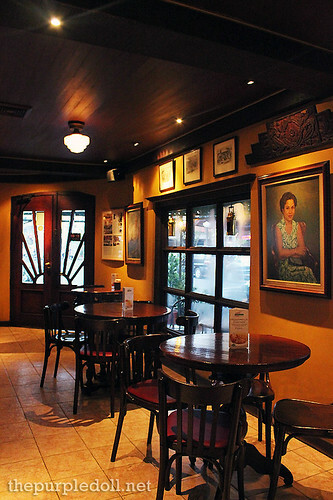 Café Adriatico is a 32-year old restaurant standing tall in the heart of Manila long before its sisters -- Bistro Remedios, Café Havana, Abé, Abé's Farm, Fely J's Kitchen, Larry's Café and Bar, and Lorenzo's Way, had been born. As the flagship of the LJC Restaurant Group, this iconic dining place and hangout spot has been a time-tested favorite of artists, writers, business leaders, politcal movers, as well as tasteful lovers. Although I prefer well-lit cafés for food photography's sake, I can't help but be enchanted with Café Adriatico's old world ambiance. Its ground floor exudes a warm and cozy feel with classic wood furnishings, old paintings and antique conversation pieces. 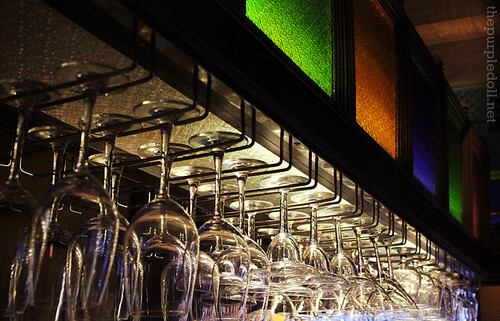 Its second floor on the other hand, transports diners to an ambient watering hole with colorful bar counter panels. With such a comforting ambiance, I found myself enjoying every forkful of the flavor-packed Pancit Palabok (P245) -- a rice noodle dish drenched with shrimp sauce and generously topped with pieces of shrimp, squid, pork crackling and half a hard-boiled egg. We also had a sampler platter of two all-time café favorites -- Lola Ising's Adobo Rice (P435) which is a savory ensemble of fried adobo pork belly on a bed of equally flavorful adobo rice, and Knockout Knuckle (P595) which is crispy pork leg deep-fried in garlic and chilies. Although I was almost full, I can't say no to Chocolaté Eh! 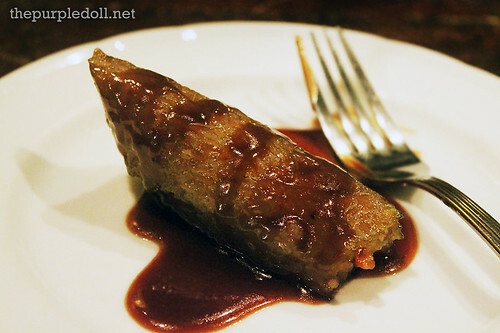 Fondue (P295) -- an ultra thick and rich blend of Philippine-grown tsokolate whipped with wooden batirol, and served with suman and mango slices. 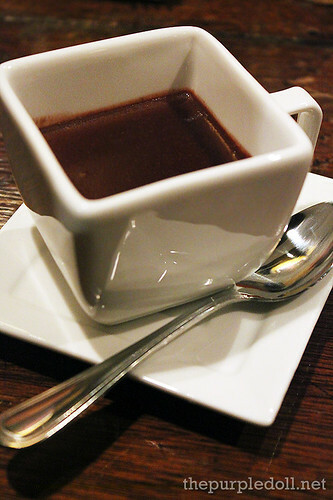 Seriously, Café Adriatico's tsokolate is one of the best ones I've had! 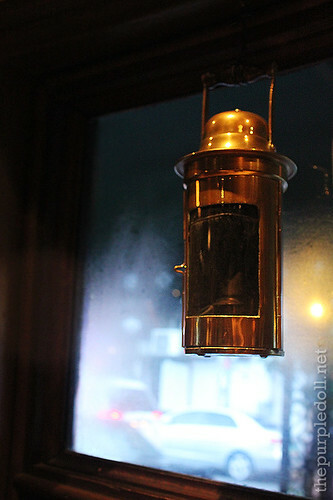 This trip to Café Adriatico has made me fall in love with the charm of the Old World even more. Although I don't frequent the area, I see myself just staying in the comfort of the café with a hot cup of tsokolate at hand while enjoying classic Spanish-Mediterranean cuisine again and again. With quality food offerings, friendly service and a lovely ambiance to boot, Café Adriatico is truly an iconic restaurant which proves to be one oldie but goodie. It would look as if time has stopped in that place! I love cups of Tsokolate! Yum! Cafe Adriatico's food is really delicious. :) Love it! nice place ,good food means Cafe Adriatco. mouthwatering palabok. great job on describing the place. it definitely sounds interesting and cozy. muntik na ko magdrool sa last pic. Delicious! I want to try that Chocolate Eh Fondue! Nakakainggit trabaho mo sister -> food taster! ヅsarap! maliit pa ako naririnig ko na yang cafe adriatico na yan, existing pa rin pala. magaling ang management nila kase most of their contemporaries nagsara na. thanks for sharing, at least may chance pa pala akong ma-experience yan hehehe. 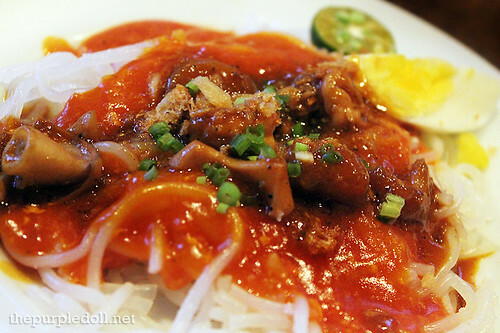 That pancit palabok looks so delicious! Arrgh! I loved CAfe aDriatico even way back. It's really cozy and the food is always good. I can't forget the prawn with garlic that I had at Cafe Adriatico. I make it at home a lot. Simple but very tasty. Great photos. I love the old world quality of the place. I've been there once together with my mates before and want to get back during our vacation in PI. It's just a plan.